This recipe by Donal Skehan is the perfect option for an extra-special weekend brunch. The romesco sauce recipe makes a generous amount - save leftovers in a jar in the fridge with some extra virgin olive oil on top of the sauce to seal its freshness. Seek out the best quality ricotta and sour dough bread you can find for this simple dish; it will make all the difference. Prepare the romesco sauce by placing all the ingredients in a food processor and blitzing until they are combined but still have texture. Season with sea salt and ground black pepper. Heat a large griddle pan over a medium heat. Brush the Tenderstem® with oil and butter and arrange across the base of the pan. Sprinkle generously with sea salt and allow to char for approximately 4 minutes either side until tender and each piece has deep char marks. If you would prefer your Tenderstem even more tender, add a splash of water to the pan and cover with a lid for 1-2 minutes. 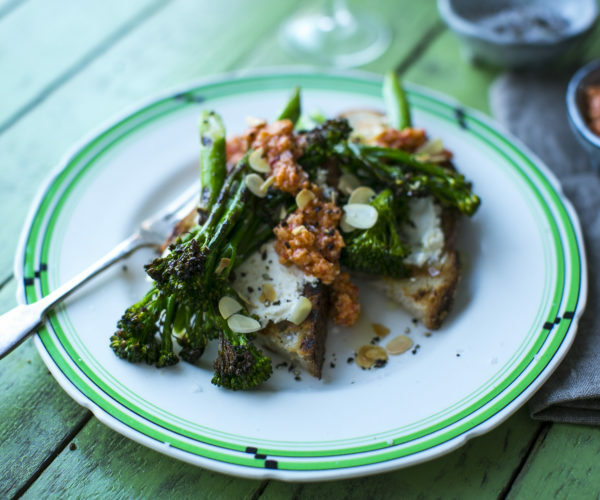 Spread each slice of sourdough toast with ricotta and top with charred Tenderstem®, romesco sauce and toasted almonds. Serve while the Tenderstem® is still warm.